Each year it’s getting harder to find gifts for him suitable for the men in my life. The problem is they have everything already. My in-laws have what they affectionately call, “a house full of crap”, my brother’s just moved his wife into his very small one bed flat and my other brother lives at home with his wife, my parents and their dog. As for John, we certainly don’t need a load more “stuff” to fill up our already pretty full home. So here are a few Christmas gift ideas for the man in your life if he already has everything! You can never go wrong with a Christmas jumper, they look awesome, get you in the spirit of the season and of course could not be more Christmas-y (is that even a word?!) if they tried. With John wearing Christmas jumpers to work throughout December and loving Christmas almost as much as I do (no one will ever love it as much as I do!) a new jumper will always be a perfect gift for him. We were lucky enough to be sent a Christmas suit* from Opposuits for John and me to review and I had to add it in to this gift guide as I think they make amazing Christmas gifts for him. My husband has to wear smart casual to work, usuall meaning he wears jeans, shoes, a shirt and a jacket. During the Christmas season they are allowed to wear Christmas jumpers but he still wears a jacket over the top. Now he doesn't have to! One of the most unique gifts you could get for anyone, but especially for your partner, is an Own a Moment* frame. All you have to do is select a memory, choose your date and time and then personalise the photo and message to the recipient. You can order a print or a frame (like I did!) and then you have something special to remember that moment for a life time. The best part is that moment is then yours. These amazing gifts are perfect for Christmas, anniversaries, weddings, new babies and so much more. Plus you get a certificate to say you own the moment and of course they won't double up the moments; so no one else will own the same time and date as you do. P.S. If you use my discount code FOLLOWME you can get 70% off emailed and printed certificates! 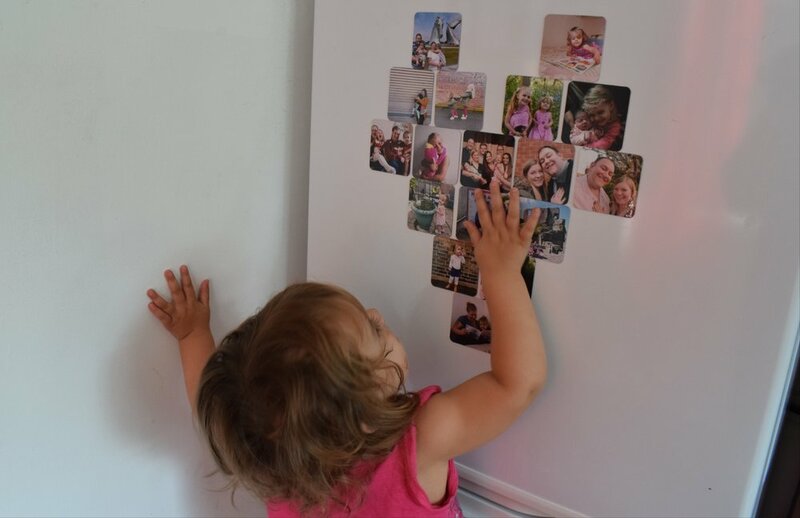 Photos are a fabulous way to record memories, but many of us (me included!) forget to get them printed. They are left stored on a memory card or hard drive, and occasionally recorded on social media. That is why I've teamed up with Cheerz to share this wonderful Christmas gift idea with you all. They sent these awesome photo magnets* which not only are a great way to capture the memories but also are perfect for my hubby as between us we collect magnets. Even better if you head over to the Cheerz website or download their app, and use my unique code NAOMICHEERZ you can get 20% off your order until the end of November 2018. This means not only can you get the perfect Christmas gift for him (or you!) but you can get it at a bargain price too! John asked for the Lazy Man Frying Pan* for Christmas last year. Unfortunately it was too late as I had bought all his gifts for Christmas and his birthday but thanks to Menkind he will now have his very own! This pans are fabulous, allowing you to cook all your favourite breakfast goodies together, however big your stove top is! Let's be honest, most men love their food and a good morning fry up all the same temperature is sure to put a smile on their face. Plus it's so big even Rapunzel would be proud to brandish it as a weapon! One of the gifts John has asked for this year is a LOGIK professional deep fryer﻿. We both love a good stir fry with samosas or spring rolls on the side but usually we have pre-made frozen ones. Plus he would love to make his own tempura and chips too. A gift for Christmas such as this fryer (which is on its way but shh…) is not only a great Christmas gift idea for him but also a super useful one that will (hopefully) have years of use to come and help us save money on takeaways too. 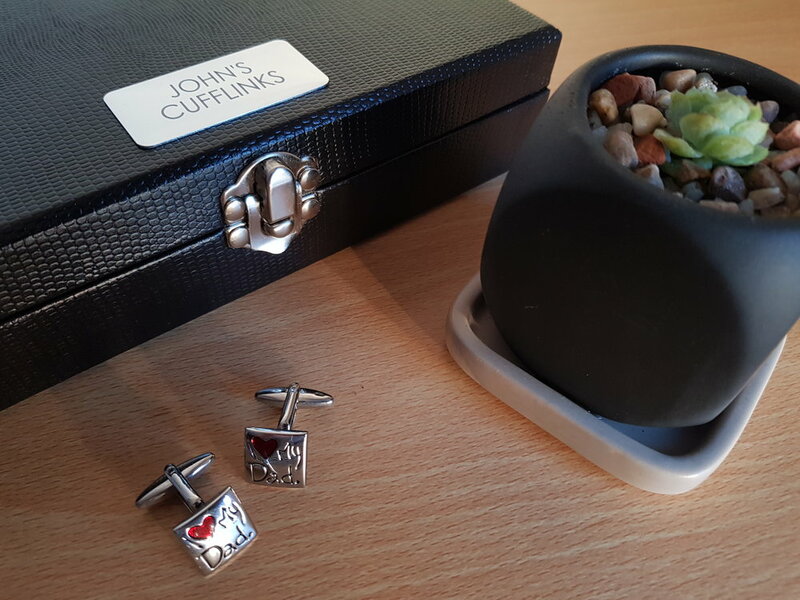 Do you have a man in your life prone to putting things like cufflinks down and then not remembering where they are or only being able to find one of the pair? I do. That’s why the twelve compartment cufflink box* from Gift Pup is such a perfect Christmas gift for him this year. 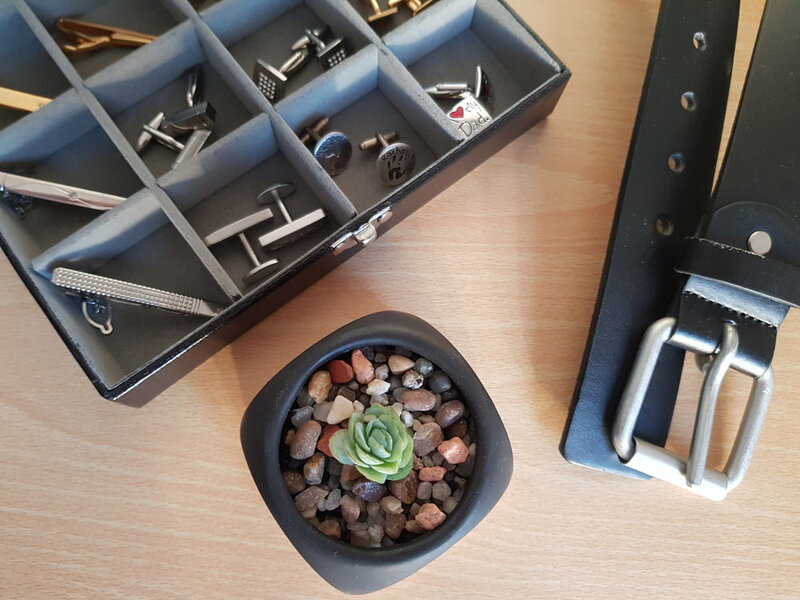 The best part is that Gift Pup offer a service to get the cufflink box personalised meaning you can ensure they know it’s their box! Looking good isn't a sign of self-importance, it's self respect. Most men need to shave. John looks like he needs to shave just a few hours after the last time he shaved. This results in him going through so many razers , and let’s be honest the razor blades are so expensive to keep replacing. This Christmas why not treat your main man to a Bic shave club subscription* so that he won’t have to worry about replacing them? The starter set is just £3.90 at the moment (regular price: £8) and delivery is always free! It is tradition for John and I to get our respective eau de toilette as a Christmas gift or birthday gift. For John is has to be Hugo Boss Bottled and the best gift idea is to actually get him a set so that he has other bits of the same scent too. That’s why this year the Hugo Boss Bottled gift set is on my to buy list and I’m hoping it’s still on offer when I get to pay day! Don’t forget when buying perfumes and after shave it is always worth shopping around as different stores and online websites may have the one you are looking for on offer. If you are looking for the perfect gift for him then you can’t go wrong with something that they will use often and get a lot of wear out of all year round. 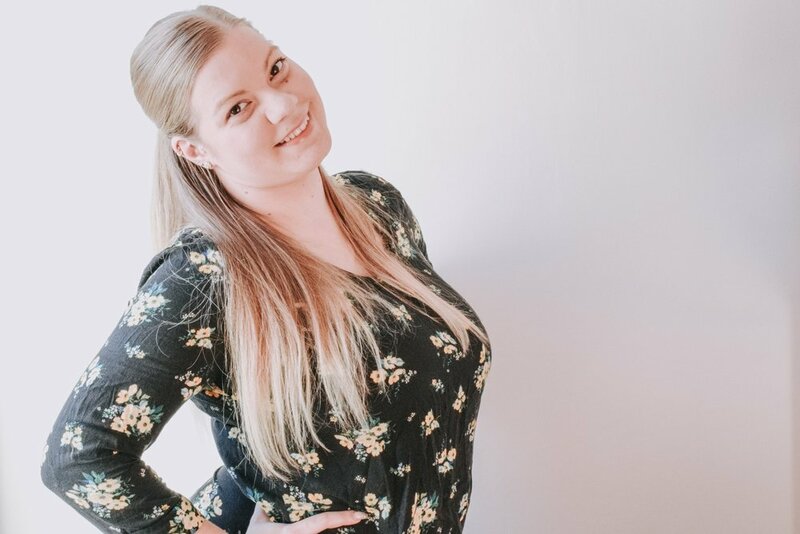 Adding this gorgeous Dobell light blue linen shirt * to your shopping list is just what you need. They come in a number of other colours too, so you can choose the one that will suit the man in your life the best. They come in sizes small to 3XL too meaning even if you have a man who usually needs the big and tall ranges like my 6ft3 husband, you’ll still be able to find one to fit. In life, as in football, you won't go far without knowing where the goalposts are. My husband is a massive sport fan, loving all things football, cricket, rugby and F1. His favourite football team has been Everton ever since he was a small boy despite his dad being a big Chelsea fan and so I knew the Everton football newspaper book* from Blossoming Gifts would be the perfect Christmas gift for him. Blossoming Gifts even personalised the book, adding his name to the front and a small message from me to him on the inside too. For an extra £5 you can even get the colour version of the book, so your newspapers are displayed in full colour. There is something very comfortable about having plenty of stationery. Stationary is always a great gift for him, because no doubt many a pen has been sent through a wash cycle thanks to them “forgetting” to take them out of trouser pockets. John does a lot of writing at work especially so having the Oxford metallic writing set* from Helix is bound to be a great Christmas gift choice! With a superior quality Fountain, Roller ball and Ballpoint pen included inside the stylish traditional metallic tin this is such to be a hit with the man in your life this Christmas. I hope you now have some fabulous Christmas gift ideas for him, and are able to get shopping ready for the big day in a few weeks time!